With the 40 S&W, you have everything you need in a self defense or range round. Designed for the FBI after their shootout in Miami in 1986, the 40 S&W was crated to have the perfect balance between expansion, penetration, and recoil. The result was a success, leading the FBI and other law enforcement agencies to use this round for years, as well as many civilians. 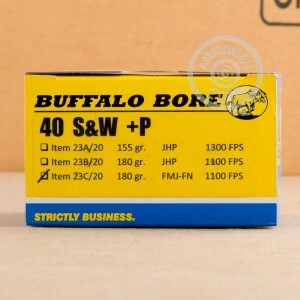 Buffalo Bore has some of the best ammo in America. 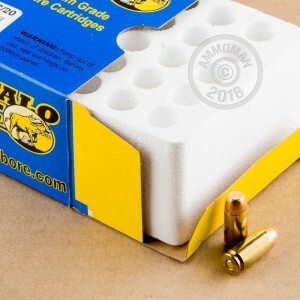 Specializing in high powered, high quality ammo, Buffalo Bore tests their rounds in widely available firearms, making sure you get ammo that is tested in real world condition, not some test chamber with potentially artificial results. With this +P full metal jacket flat nose ammo you are set for high quality range training with high velocity loads. Each projectile weighs 180 grains and is loaded into a premium non-corrosive brass casing that is re-loadable. These +P rounds achieve a muzzle velocity of 1,100 feet per second. Pick up a couple 20 round boxes of this 40 S&W FMJ-FN ammunition today!